One of the things I love most is when the creator of another world makes me crave a food or drink that doesn’t exist. For fun, I thought I’d make a list of the top 5 I’m desperate to try. My husband frequently jokes that he’s going to buy me a shirt that reads “Instant human. Just add coffee.” So, as you might imagine, a coffee was going to make this list. Raktajino is a strong, dark coffee introduced to Federation citizens by the Klingons. Barely an episode of Star Trek: Deep Space Nine goes by when someone doesn’t order one. I’ll take mine extra sweet, thank you. I want to go to the Wizarding World of Harry Potter at Universal Studios in Orlando just so I can try a butterbeer. Based on the Harry Potter movies, it looks thick and creamy, and it’s topped with foam. I’ve heard talk that it tastes like butterscotch. I’d only want to try these in a controlled environment (after all, I don’t want to be eaten by my own cats or crash through the roof of my house), but it’d be a lot of fun to be giant or tiny for a little while. 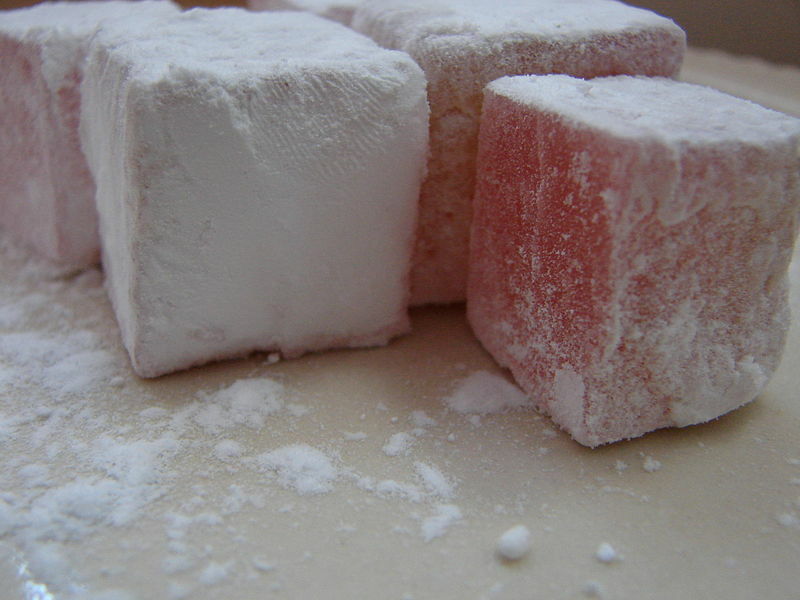 Turkish Delights exist in our world. They’re basically flavored gelatin coated in powdered sugar or covered in chocolate. They’re a bit like a giant jelly bean center really. The Turkish Delights in The Lion, the Witch, and the Wardrobe are enchanted so that once you eat one, you desperately want another and will keep eating them until someone stops you or you die. I don’t like that aspect of it, but my theory is that means they’re the most delicious thing you’ve ever tasted. I’d just need to make sure to eat them with someone trustworthy around to stop me. Your turn—what imaginary food or drink would you love to try?